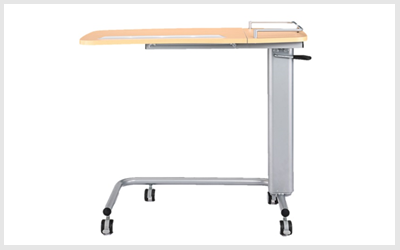 The unique design has an easy lift mechanism allowing the patient to effortlessly raise the table top from any position and is lowered by using the handle with no bending required. 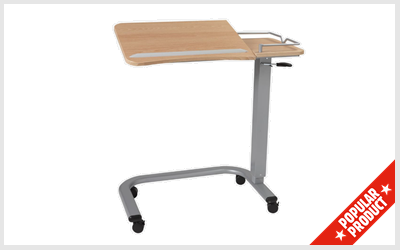 GAS LIFT OVERBED TABLES : WHY CHOOSE CODACARE HOSPITAL OVERBED TABLES? Gas Lift Overbed Tables – EVO Australia is our premium range, the table top can be made with high pressure laminate (HPL), a marine grade board that comes with a 10 year warranty. HPL is impact and scratch resistant and does not fade over time. This range is superior to any product currently on the market and is becoming increasingly popular due to its increased life span. 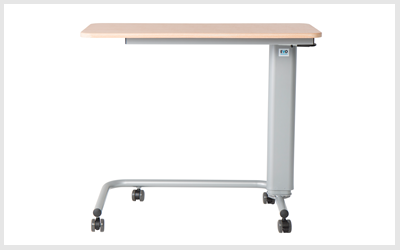 The overbed tables are auto lift meaning that no bending or vigorous movements are required by staff and patients alike. We highly recommend this product due to its longevity and cost effectiveness. This gas lift overbed table frame is adjustable and fitted with heavy duty castors allowing for constant moving and handling making it an excellent choice for hospitals and aged care facilities. 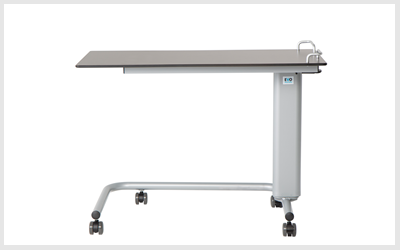 EVO Australia Hospital overbed table design is modern and guaranteed to outlast all overbed tables currently on the market. You can choose from our existing range of Hospital Overbed tables or have it resized or custom made to your specification. Your furniture can be designed for a specific purpose or made to fit your plans. We ensure that your product meets regulatory requirements and we use materials backed with the requisite standard certifications that are customary in the healthcare industry. CodaCare understand the rigorous process of tendering for large scale projects and can therefore partner with you to achieve your objectives. We have staff experienced in tendering to commercial, government, subcontracting and private sectors.